Home > News > Not a groundhog! (March 23, 2018) The attached photo was taken on March 23, 2018. 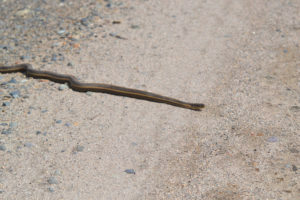 It is the first Giant garter snake sighting Conservancy field crews have seen this year. Of course, it helps that sunshine was prevalent and in the previous number of weeks, it has been cold and/or rainy. For those of us on the staff, this marks a certain rite. It means that we move into gear as facilitating Giant garter snake activity and managing the marsh complexes accordingly. This is a very good sign!